Professor of Kharkov Pedagogical University Mikhail Getmanets is editing his new book «Search of the Kayala River». In this book he intends to criticize the version about a place of loss of Russian host, which was advanced by academician B. Rybakov, Russian historian and explorer of literary monument of Kievan Russia "The Lay of the Warfare Waged by Igor". It must be said, that a place of Igor's battle with Polovtsi for a long time (for two hundreds years) is looking for by many famous historians and explorers, since N. Karamzin till B. Rybakov. But in vain for the time being. The most valid version on moving of Old Russian prince's host to Polovets plain and on possible place of its loss is advanced by kharkovian Mikhail Getmanets, as Ukrainian specialists consider. 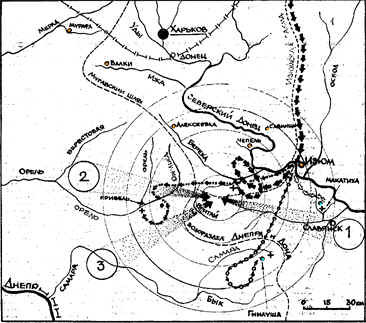 However, concerning the way of Igor from his native city of Novgorod-Seversky to the Salnitsa river, flowed into the Seversky Donets near the town of Izyum, overwhelming majority of explorers are not in variances. But where had he followed further — at that point scientists are not agree till nowadays. For example, Kharkov historian D.Bagaley supposed, that from the Salnitsa Igor went to the Kalmius river (to present Donetskaya Region). N. Karamzin believed, that he went towards Tmutarakan and the Sea of Azov, where his battle with Polovtsi had happened. Apropos, it's one of the most disputable hypotheses. First of all because it's doubtful whether seven thousands of warriers, even the bravest and the most experienced ones, could dare to pass with fighting almost a thousand kilometers into the heart of Polovets plain. And from the other side they just hadn't enough time to reach the place of their death — it is known from annalistic sources that after crossing the Salnitsa Igor was defeated on the third day already. As to academician B. Rybakov, he «sent» Igor, the son of Svyatoslav, to the south — towards the Samara river, to the Dnieper river basin, where, in accordance with his version, the Russian host found its loss. Mikhail Getmanets disagrees to him categorically. By his words, the Russian historian argue his own version only by one doubtful fact: Yaroslavna, in "The Lay..." text, appeales to the Dnieper river and asks it to give back her husband be taken prisoner. But she, as M.Getmanets takes notice, appeales at the same time both to the Danube river, and to the Sun, and to the wind, therefore all her that "lamentations" have purely rhetorical character and aren't connected geographically to some area. Besides, the distance between the Salnitsa and the Samara is more than 100 kilometers. The cavalry together with transport just couldn't pass such distance in one night. And above all — was Igor in need to make such a long way to Polovtsi? By Getmanets' opinion, Igor's campaign in 1185 was usual raid on the nearest nomad settlements at region of the Seversky Donets and the Oskol rivers. And nothing more than that. Similar raids, as it is mentioned in historical annals, Igor made also after his return from Polovets captivity. For example, the raid with his brothers in 1191. It should be noted that M. Getmanets had studied a great number of former versions. It seemed to him that the most probable was the hypothesis of Izyum historian Nikolay Sibilev, who believed, that Igor's battle with Polovtsi had happened somewhere between Izyum and Slavyansk. Getmanets considered it as basic one and began check it up. While his research he combined for the first time the theoretical exploration of the problem by annalistic sources with examination of local history materials. Just that approach became a clue to many secrets of Old Russian prince campaign against Polovtsi. Because no one of scientist before him "fitted" the events of 800-years ago to local area. Mikhail F. Getmanets studied the area of supposed fighting of Russian and Polovets regiments for all fifteen years, he strolled over several thousands kilometers. Moreover — he even made an experimental riding on horseback from Novgorod-Seversky to the Salnitsa river, closed as much as possible to conditions of Igor's campaign in 1185. All that allowed him to substantiate his own suggested theory in details and to take into account geographic and topographical reference points, mentioned both in annals and in "The Lay". Many of his «discoveries» are now added to their armory by Russian and Ukrainian explorers, including B. Rybakov himself. — «The Lay of the Warfare Waged by Igor» left us a great numbers of mysteries — historical, geographic, linguistic, — says Getmanets. — One of them is the Kayala river, on the banks of which Igor's campaign ended tragically. To find the Kayala — it means to connect more closely the literary monument to historical epoch, and the hostilities described in it to concrete area. As it is known, after the Salnitsa Igor's armed forces marched into Polovets territory, moved all through the night and early in the morning met the Polovets regiments at the Syuurly river. Taking into account the experience, which he had got in the experimental crossing from Novgorod-Seversky to the Salnitsa, Getmanets came to conclusion, that in a short May night Igor passed, according to annals, «going little by little» no more than 30 kilometers. Just at that distance from present Izyum he began to find the Syuurly. But first of all he needed to find an ancient road. Because at the times of old armed forces moved only along well-known historical ways. Supposition that the regiment could march strait across the wild plain is the greatest delusion. Firstly, the wild plain was covered with brushwood of herbs, bushes and trees, i.e. was practically impassable. Secondly, in the open plain Polovtsi could spot Russians at once. Therefore up to the Salnitsa the host moved along "the Izyum's Sakma Way", and further, in accordance with the antique "The Big Draft Book", the way bifurcated: one road — «the mountain way» — directed to present Slavyansk, another was of opposite direction — towards Muravsky Shlyakh. In «The Lay» a long mountain is mentioned — «shelomya (helmet)», after passing by it the warriors claimed: «O Russian land! Far are you now beyond the shelomya!» One can see this mountain today also, on the way from Izyum to Slavyansk. Getmanets went by «torki» road along the unknown river to other topographic point — to the Syuurly. Ten thousands host couldn't manage without water in a long time passage. Getmanets believe, that this unknown river fully may be the present Kamenka. And then the annals say, that at the down the host's way was bared by Polovets regiments, standing at the Syuurly river. It must be situated not so far (in 25 — 30 kilometers from the Salnitsa), besides it must be not so big and deep, because it is known, that Polovtsi from the opposite bank «shooting each one arrow to Russia... galloped away», and Russians «crossed» this river without any empediment. By Mikhail Getmanets' version, the present river Golaya Dolina (Bare Dale) is evidently that the right Syuurly. — I have studied this area attentively and found there the high barrow very convenient to put the plain under observation, — says the historian. — I believe, that headquarters of khan Konchak was situated at the town of Slavyansk on the Tor river. And along the Syuurly he put surely advanced detachments to protect the Polovets land. Because he could not allow himself to keep field open in the direction of Russia. Just there the first battle between Russians and Polovtsi had happened. Igor's regiments gained a victory over rather few nomad forces, began to pursue them deep into plain, and in the evening, after coming back with "polon (captives)", they decided to stay overnight there. And when prince had woken up in the early morn of May 11, he saw that Russian forces are surrounded by Polovtsi, and they «go from the Don and from the sea», «even dust screen the fields». And then he took the decision to break out towards the Donets for to be screened by forest. But Polovtsi guessed his intention and barring the way to Russians began to press the enemy to the river with steep banks — to the Kayala. And it was the great battle: "From morning till evening", and then "From twilight till dawn". In the heart of the Polovets land". From the Kayala banks, according to annals, Igor, being captured yet, saw his brother Vsevolod, who was fighting foolhardily, moving "around the lake". Final events of the battle are going on at the lake shore, because a chronicler ends his narration with following words: "and the rest were trampled down in the sea». It means that the lake was large. And to the third day afternoon, says author of "The Lay", the banners of Igor fell. Exactly so the Russians had finished their campaign, "And were laid low themselves/ For the Russian land". Taking into account all these facts Getmanets began to seek the huge field, where seven thousands of Russians and a greater number of Polovtsi may be located, and where the lake and the river as watering place are situated not so far from it as well as the Seversky Donets. And he found such a place near the village of Glubokaya Makatikha. And after that he concerned himself with search of the legendary Kayala, which became a place of death for Russian host. — From Turkic language Kayala may be translated as "Rocky", therefore its banks should give a proof of this name, — explain M. Getmanets. — But there was no similar river near the place that I found. Excepting the small Makatikha, which becomes in spring full-flowing and swift, as it is mentioned in "The Lay". But one day he noticed that the collective farm fields situated near the river are peppered with huge stones. Local residents told him, that in the past there was "skelya (the rock) and the stone quarry based on it. Getmanets began to excavate the Makatikha banks and... revealed its rocky banks. It was just a discovery. Version that the Kayala is symbolic river, as a matter of fact, was disproved. Nevertheless there are some other facts to sertify the guess of Getmanets that events of "The Lay" developed between he settlements of Izyum and Slavyansk. And prince Igor himself, as shown in annals, was in captivity at region of the Tor river near Slavyansk. Not all scientist consider the hypothesis of M.Getmanets as the only correct. But you must agree that it seems very closed to truth.